There is a good chance when you walk into a small business meeting room or boardroom apart from the tables and chairs you will be greeted with an ugly old projector and if you are lucky a white wall to show your presentation on. Sadly most projectors are woefully outdated for business use. You spend 10 minutes finding the correct cable, another ten trying to find the right mode for the projector to work and then finally the only way you can get the projector to focus is by moving it so close to the wall that the actual area of your presentation is tiny. Chromecast changes all that as our clients have already found out. HD TV's have a much sharper and clearer picture than any office projector. They are wall mountable and take up less space. They look good giving a great modern feeling to your meeting rooms. They are multi use. You could use them solely for presentations, but where is the enjoyment in that? With Chromebox for Meetings you could also use the TV for video conferences with clients and customers. And with more and more apps and programs supporting Chromecast the list of what you can use your Chromecast for is growing. With good quality 40" plus HD TVs retailing for as little as £400 there really is no reason for you not to replace that aging office projector. No more hunting for that weird proprietary cable that you need to successfully connect your laptop to the projector. Chromecast does not need any specialist cables or software. Instead it just needs to be connected to a WiFi network. With a typical projector you are limited to presenting from a laptop as tablets and smartphones don't have the ports or software required to connect. With Chromecast you can present from any device. Yes! Thats right you could present from your tablet with a touch of a button, stream a video from your smartphone with a tap of a button or share a document from your laptop with a single click of a button. Does your client have a TV in their meeting room? More and more do. Now you now longer need to hump around a heavy bulky projector and then set it up again. 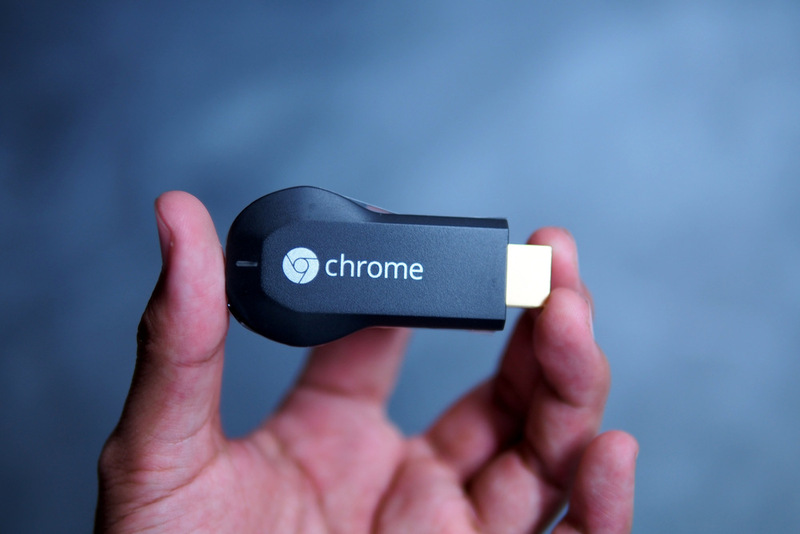 Instead slide your Chromecast into your pocket and plug it into their TV when you arrive. You will be presenting in no time at all. Chromecast will officially launch in the UK in March and will cost around £30. With a price like that Chromecast really is a no brainer for all small businesses. You maybe wondering how our clients have already taken advantage of Chromecast? Being an Authorised Google Apps Reseller we have been lucky enough to be able to import it from the US!